One of the most convenient things about our pop up camper is our cassette toilet. I never imagined we would use it as frequently as we do. 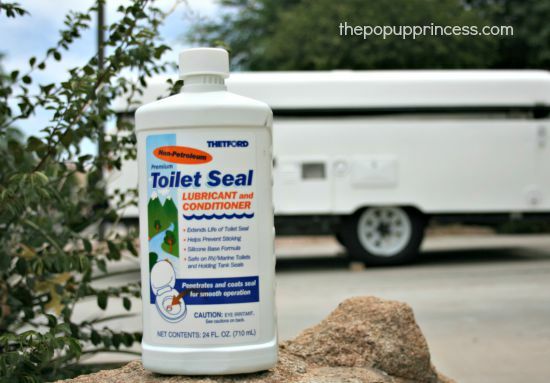 In fact, when we were shopping for campers, I didn’t even have a potty on our “must haves” list. Late night bathroom trips in bear country quickly changed my mind, though, and we are so glad we have this little convenience in the trailer. The actual operation of your cassette toilet is pretty easy. Under the toilet itself, you’ll find the holding tank. This is essentially your “black water” tank. 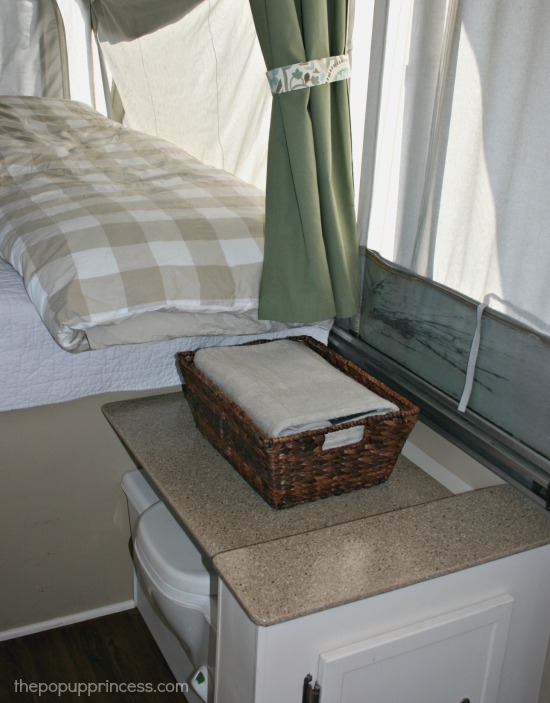 We have an access door to the tank inside the camper, but many models have access doors located on the outside of the camper. Either way, when you open the access door, this is what you will most likely find. The first thing you’ll need to do is fill the flush tank. 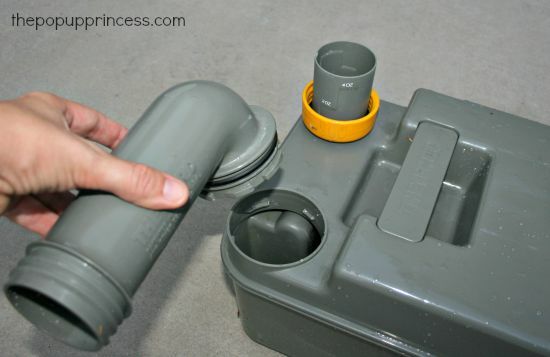 To fill the flush tank, rotate the fresh water fill spout 90 degrees away from the tank and remove the yellow cap. As you fill the fresh water tank with clean water, pay close attention to the glass vial on the side of the tank. That’s the fresh water level indicator. 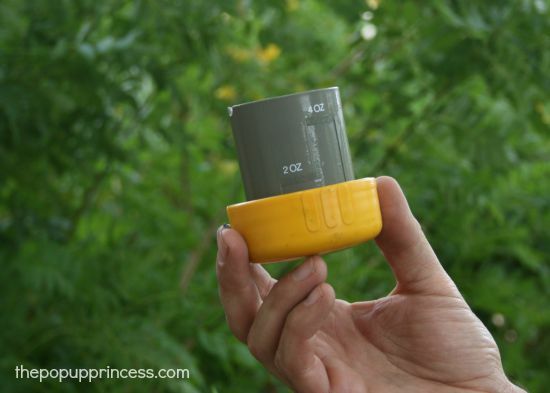 When the water is about 1/2″ from the top, your tank is full. You can also use an additive in the flush tank, but we never have. We’ve done just fine filling the fresh water tank with clean city water. Once you are finished filling the tank, you’ll need to drain the remaining water from the fill spout. 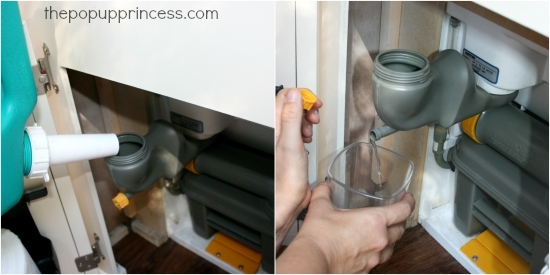 If you have a drain nozzle on the side of the fill spout, unscrew it and let the water drain into a cup. If you have no drain nozzle, your fill spout may be designed to rotate. If that is the case, rotate your fill spout and pour out the excess water. You can then screw the yellow cap back on your fill spout and return it to the original position. Now you need to add chemicals to the holding tank of your cassette toilet. This will take care of any unpleasant odors in the the tank. 😛 We like to use liquid Aqua-Kem because it is relatively cheap and readily available. You can find it at Amazon, Walmart, or Camping World. Thetford recommends removing your holding tank by pressing down on the safety catch and sliding the tank outward. (Make sure that the valve blade–the rubber flapper inside the bowl–is closed when you do this.) 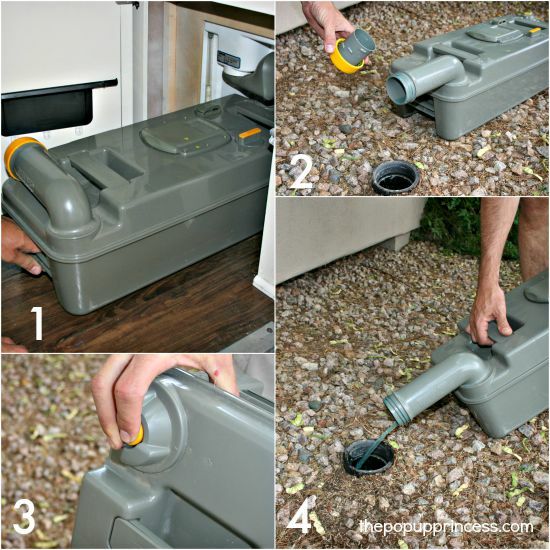 Set the tank upright, rotate the emptying spout upwards, and remove the yellow cap. The yellow cap conveniently has a measuring cup built in, so you can accurately measure the amount of Aqua-Kem to add to the tank. We usually add about 4 oz. of Aqua-Kem and 2 liters of water to the holding tank. You’ll want to make sure the bottom of the tank is covered. From the outside, this is what our cassette toilet looks like. There is a valve blade inside the bowl, which when opened, empties the contents of the bowl into the holding tank below. 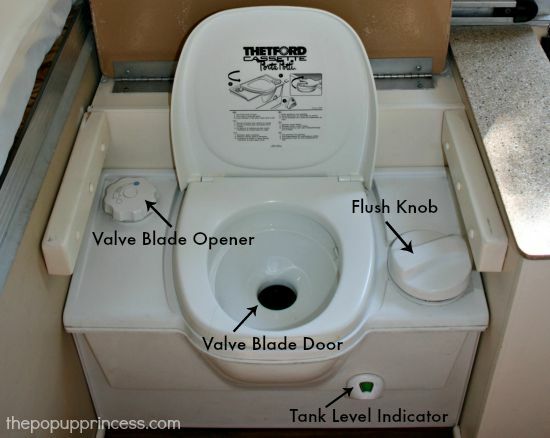 To use the pop up camper toilet, turn the flush knob several times to fill the bowl with water or open the valve blade, which ever you prefer. 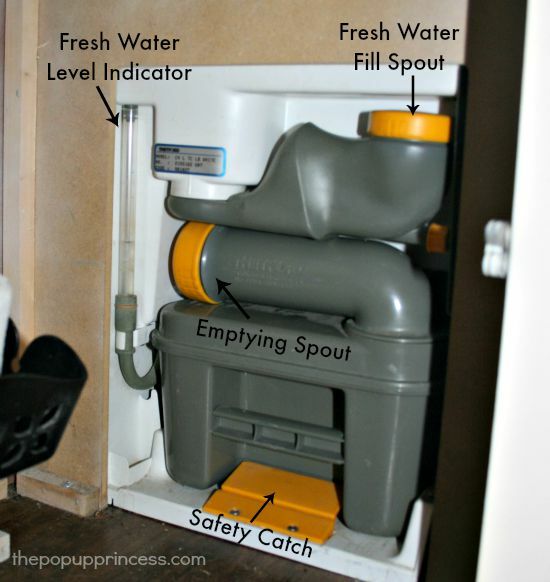 You should empty the waste tank on your pop up camper toilet as soon as the level indicator turns red. In fact, Thetford actually recommends emptying the tank before it is completely full. If the waste tank is too full, it will be more difficult to empty, so we usually empty our tank when it is about half full. Thetford cassette toilets were designed to be easy enough to empty in a bathroom toilet, but we haven’t done that yet. 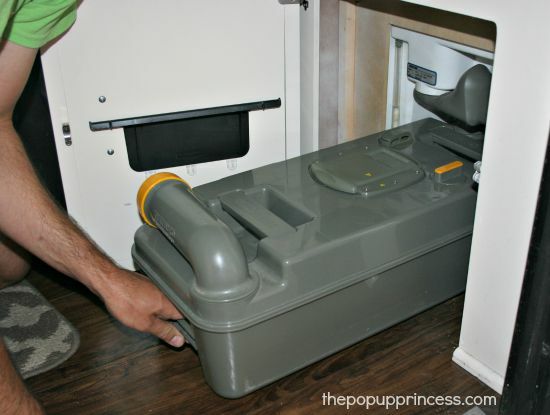 We usually use the campground dump station or the sewer clean-out at home. Check your campground rules for specific waste dumping regulations before you tote that tank into the public restroom. 😉 Here’s how to empty your waste tank. Make sure the valve blade is closed, and push the yellow safety catch down. Grasp the tank by the handle and pull it outwards. Rotate the emptying spout 90 degrees and remove the yellow cap. Hold the waste tank by the upper handle with one hand. Grasp the back of the tank with the other hand, making sure you can depress the vent plunger easily. This will allow you to empty the tank without splashing. Empty the tank into the appropriate waste receptacle by tilting the tank forward while depressing the vent plunger. Then thoroughly rinse the tank and valve blade with fresh water several times. To thoroughly clean our waste tank, we remove the emptying spout by rotating it 180 degrees from the original position. It will then slide up and off the tank, allowing us to get the spout and tank really clean. We usually use about a quarter of a cap of Woolite and lots of fresh water. Then we replace everything and return the tank to its place under the cassette toilet. 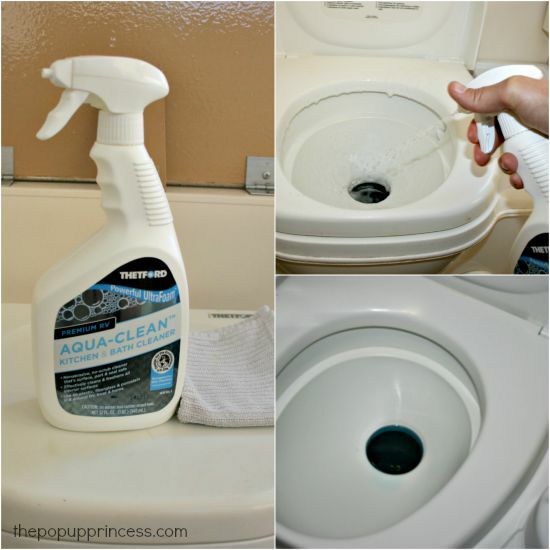 If we will be using the toilet again, we refill the deodorizing chemicals. If we are storing the camper, we open the valve blade to let the holding tank dry out well. To ensure your valve blade lives a long life, you’ll need to give it some love, too. The valve blade is like a rubber flapper, and can be damaged if not properly cared for. Once your valve blade and seal are damaged, they may leak or stick. To prevent that from happening, we use a toilet seal lubricant and conditioner from Thetford. We love this stuff. When we first got the camper, the valve blade stuck when we’d try to open it. After several applications of Toilet Seal, it now works perfectly. We use this stuff a couple times a year to keep everything running smoothly. We buy it on Amazon, but I’ve seen it at Camping World, too. If you can’t locate Toilet Seal, you can also use pure olive oil to lubricate and condition your seals. Never use Vaseline or vegetable oil, though, as these may cause leakage. Thetford recommends that you empty your fresh water and holding tanks before traveling to reduce the risk of leaking or flooding. I’ll be honest, we’ve traveled a couple of times with water in the tank and had no issues, but it’s always better to be safe than sorry. So that about sums it up! 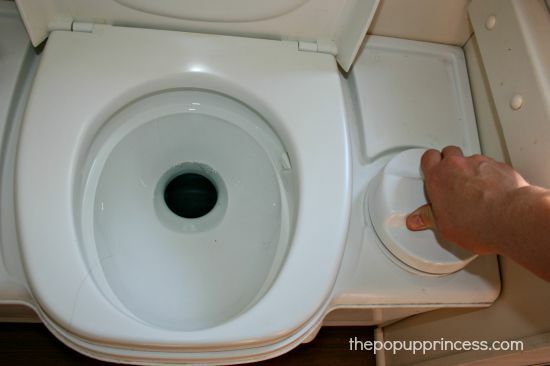 I hope you’ve learned a few things, and if you’re already a porta-potti pro, feel free to share your advice with us in the comments section. Thanks Larissa, that was very detailed and helpful. Happy Camping and stay away from the bears, lol. Our Coleman Sun Valley did not come with a cassette toilet. Since we wanted a toilet we hunted and discovered the Thetford Curve toilet and it has worked great! At night we keep it in the camper so we don’t have to make a midnight run. For extended camping stays we bought a shower tent and put the toilet in that for day use. It’s light enough to move and large enough to not have to empty frequently for a family of five. Highly recommend for those not lucky to have a built in cassette unit. Thanks Larissa, we have a ’99 Santa Fe too. And all of your posts seem to timely correspond to what we need to learn. Thanks! Thank you very much for the fine article. Answered all questions about this toilet. Wife and I just bought our very first, 2005 used , pop up and have a lot of learning to do. Just discovered you from pop up portal. You are my new super hero! Hope to meet you camping some day. My 03 SKAMPER (discontinued mfg) did not have toilet, so I got the thetford tall toilet. Now that I see what’s involved w a built-in, portable seems easier & takes up less space. How do you empty the remaining water before you leavethe camp site? Is it all in the cassette you pull out? We just bought our pop up and have yet to use it. Trying to prepare as much as possible. Thanks! Keep the tutorials coming, I’m sure there are still lots of things you and Mr. Two Types of Fun can teach the rest of us. Cannot flesh the toilet. Could it need a new fuse or new motor. Pop-up camper is only a year old and not used very often. Have never seen this problem addressed. Email is all lower case. Thank you. The flush knob on our toilet will not pump the fresh water into the bowl. The water tank is full. Any suggestions? How would you prime it? Do you have an automatic flush, Emma, or is it manual like ours? We just got our new pop up and we have a cassette toilet just like yours. I found a curtain/skirt to go around the cassette toilet with snaps at the top, but don’t see any place to attach the snaps. I am wondering if I am missing something? Do you have a curtain like that? We have a 2004 Fleetwood Redwood (a Highlander). Hmmm… Ours has snaps on the ceiling of the PUP, Kitty. Do you not have snaps? I’ll see if I can take a picture next time we have the PUP open. Thanks, Larissa – No, I don’t think I have snaps on the ceiling. A picture would be great – I have looked all over the internet and cannot find any pics. I love the fact that there is a partition curtain, just need to figure out how to hang it up. Thanks in advance for the pics! Thank you very much for posting this information, very helpful indeed! Where do I find one of these toilets at and how much are they? Thanks for the great tutorial. Now I must get on with the mods and making my 06′ Santa Fe look great like yours. Speaking of bears, the National Parks want you to store food and even cosmetics or anything that has a scent someplace other than in your tent. Anyone know what whether the odors of the aquachem and other tank additives fall under this directive? When we camped in both Sequoia and Yellowstone, we were told by the rangers that the Aquachem in our cassette toilet tank was just fine. We detailed our trip to Yellowstone here and the one to Sequoia here. I cannot thank you enough for this post. We’ve had our 2016 Pop-Up, with one of these cassette toilets, since March. Our user manual DID NOT COME with instructions on how to use it! We’ve gone on 12 campouts and have NEVER used it, but I will definitely be taking this knowledge with me this weekend when my son and I go out! NEXT, going to see if you have any posts on how to get my WATER HEATER going! what do you use for privacy when using the toilet? Searched high and low for this info! Should’ve known you’d have the best demo! Thank you very much this really helped New to camping just bought a 2012 jayco with cassette system,. Is there a line that goes from the potty directly to the sewer? We are new to camping and I have researched with no definitive answer! No, Virginia. All the waste is stored in the cassette tank directly under the toilet. 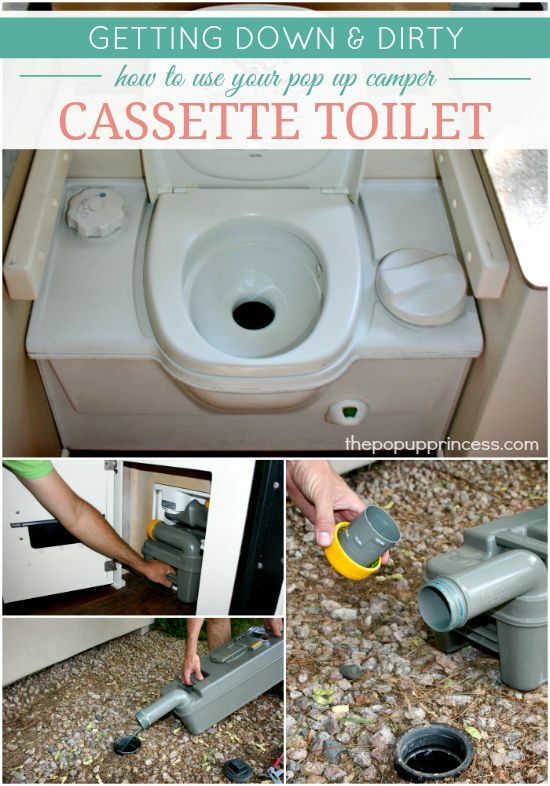 Check out the section in the above post on “Emptying the Cassette Toilet Waste” for information on how to empty the tank. You can empty your tank into a sewer clean-out, but there is no direct line from your camper. Has anyone ever made a adaptable part/ homemade hook-up to the sewer site? Excellent article, very helpful. I’m wondering if there’s a replacement for the lid. We just bought a pop-up and the toilet lid is cracked. I noticed you said you use this when in bear country. Are you not worried about the waste being inside the camper, therefore attracting bears? They’re still attracted to those scents, and I was told it’s best to not go in your camper. Thoughts? Up is a 2000 Coleman bayside that has a refridgerator that doesn’t work. Has anyone ever removed that and put a toilet in it place? I wonder if that would work? You are incredible! I went to google to see about a toilet for the popup – clicked and there you were! Great details – you are the popup GODDESS!!! We just purchased a 1996 Jayco popup jaybird. We have the same Cassette but ours won’t flush? I been trying to trouble shoot but am wondering if you have run into this problem or know of a site or resource? Does it have a fuse? I have not run into that, Audrea. Ours is not electric, so we don’t have a fuse. Have you tried contacting the manufacturer? What do you pull your camper(s) with and does it have a transmission cooler installed? Thanks for the great advice! We have recently purchased a 2001 viking tent trailer(pop-up). It didn’t come with a manual and the previous owners said they had never used the the cassette toilet. Thanks for this. I found it very useful. I have one very similar except where you have a flush mine is a toilet roll holder. TOnce again thanks for putting this together . I just bought a pop up with this kind of cassette toliet. Do you think its possible to run an rv dump hose to the Emptying Spout so that it can drain into a full hook up sewer site?